In a post-apocalyptic future, centuries after a catastrophic event known as The Midnight changed the world forever, humanity exists in a largely technology-free state of existence. Paradiso follows the journey of Jack Kryznan who is haunted by a pivotal event in his childhood when he gained possession of the mysterious object known as the Pneumas. Looking for answers he seeks passage to the sentient city of Paradiso – one of the last thriving locations on the planet – where he believes he will make sense of the questions surrounding his past. One small act of kindness, though, will bring other factions into play. Jack will find himself pursued by the powerful faction leader Hazard, encountering the terrifying cyborg guardians of the city and meeting the scavengers who lurk within its walls. Layer upon layer of mystery is gradually uncovered in an epic sci-fi saga from the team of Ram V, Devmalya Pramanik, Dearbhla Kelly, Alex Sollazzo, Aditya Bidikar, Alba Cardona Gil and Mathanki Kodavasal. All edited by Lizzie Kaye. 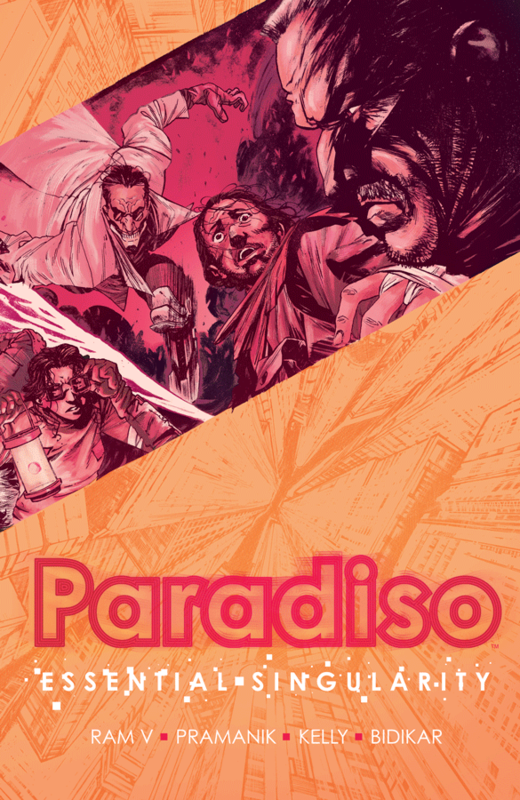 Paradiso is not always an easy read and that’s a positive thing! Ram V pulls the audience in with scraps of information about the book’s bigger picture, gently teasing them with new revelations, and ensuring that every answer he does give only opens up more questions. It encourages an added level of interactivity with, and immersion in, the narrative and means that Jack’s quest for the truth is neatly mirrored in the audience’s reading experience as they too look to put the puzzle pieces together. What is the true nature of Paradiso and its Guardians? How many of the legends surrounding it are rooted in reality? 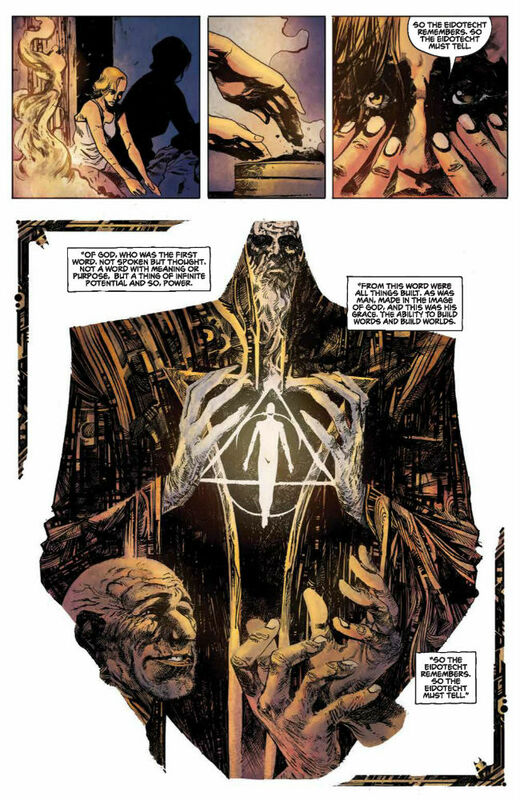 Who or what is the mysterious Watcher? Where does the strange reality-altering fog that infests the city come from and what is its purpose? And what is the city’s role in so many of the cast’s pasts? Just some of the questions posed by a series that is narratively reminiscent of Lost… except with a proper long-term gameplan. Every re-reading offers up new clues and possibilities. If you want more than decompression and facile escapism from your serial comics then Paradiso is most assuredly the book for you. 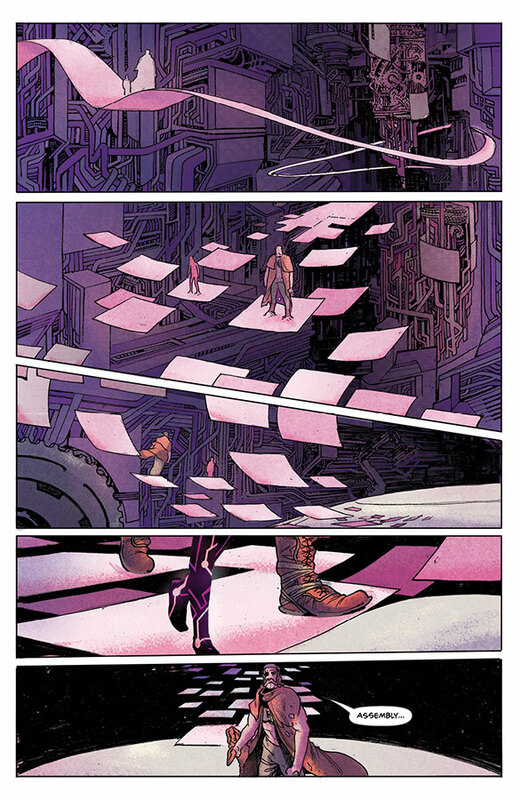 Rising star Aditya Bidikar won the Best Letterer Award in last year’s Broken Frontier Awards while Ram V was nominated in the Breakout Talent category. So you know from a BF point of view we already have a lot of regard for the creators involved. This is world-building at its finest with Ram V achieving the unlikely and giving us a fresh spin on the standards of post-apocalyptic fiction with a city that seems to be trying to comprehend the people within her boundaries as much as they are attempting understand her. Artist Devmalya Pramanik realises those concepts with stunning depictions of this ruined world in all its unlikely contradictions from barren vistas to twisting, claustrophobic city environs. With the most atmospheric colouring from Dearbhla Kelly, Alex Sollazzo and Alba Cardona Gil giving every city environment its own distinctive atmosphere this is a creative team working in sublime harmony. Yes Paradiso is a book full of pure, grand sci-fi concepts and they’re at the forefront of the reading experience but on a subtler level the diverse cast of characters gives Paradiso a vital authenticity. Humanity is in its end times and this last standing hub of civilisation would, of course, find itself housing a cosmopolitan population. A true dystopian future but one with glimmers of hope – where the last of humankind is drawn together not so much for its final stand but to rebuild civilisation together. 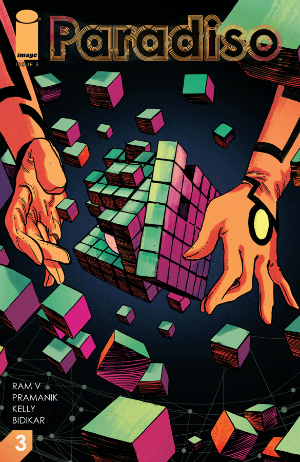 The first Paradiso trade Essential Singularity is now available from Image Comics. 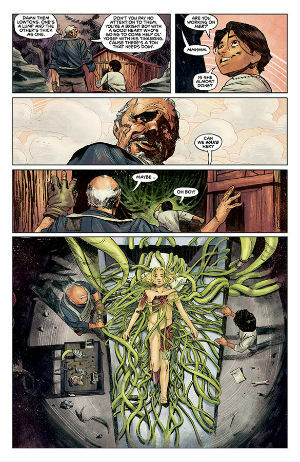 The comic is published monthly by Image Comics priced $3.99. Staff Picks for September 20, 2017 – Thought Bubble Anthology 2017, Gasolina, Angelic and More!